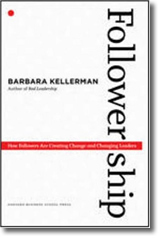 Followership : how followers are creating change and changing leaders by Barbara Kellerman. Harvard Business School Press, 2008. As a follow-up to the book Bad Leadership, author Barbara Kellerman writes about the complex relationship between those who have power, authority and influence and those who do not. Most organizations have systems and structures in which superiors control their subordinates. Yet sometimes the line that separates leaders from followers is blurred. In addition, leaders may find themselves following and followers end up with more power and influence than their leaders. And most managers are both superior and subordinate at the same time. The most interesting part of the book is the discussion about different followership styles in Part II. Author Kellerman outlines five types of followers: Isolates, Bystanders, Participants, Activists and Diehards. These followers range from those who are completely withdrawn to those who are fully engaged, either in support of or in opposition to their leaders. This book contains vivid examples of leadership issues. Most interesting are the chapters about Merck’s marketing of its miracle drug, Vioxx; and about Cardinal Law and the Voice of the Faithful in Boston. Martin, Roger L. The opposable mind : how successful leaders win through integrative thinking. Harvard Business School Press, 2007. Author, and Dean of the Rotman School of Business, at the University of Toronto, Roger Martin studied fifty superior business leaders to discern a shared theme — what makes these people successful? He found that these successful business leaders had a special way of thinking. When faced with problems, they all were predisposed to construct solutions using diametrically opposing ideas, those that seem, on the surface, to be mutually exclusive. Successful leaders avoided settling for one alternative or another, but instead they produced a synthesis that was superior to either of the opposing ideas. Martin calls this thinking process Integrative thinking. One example that Martin uses is a local company, Red Hat in Research Triangle Park. In the mid 1990’s the software industry was dominated by two business models. In the proprietary software model, companies invested heavily in research and development, guarded their intellectual property and charged high prices. These companies had high profit margins. The alternative model was the free software model where suppliers sold CD-ROMs that included both software and the source code. Prices were low but volume was high. These seemed to be the only two alternatives. Cohen, William A. 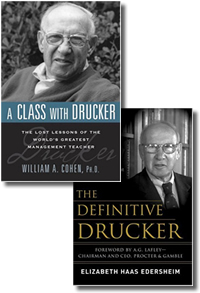 A Class with Drucker: The lost lessons of the world’s greatest management teacher. AMACOM, 2007. Edersheim, Elizabeth Haas. The Definitive Drucker. McGraw-Hill, 2007. Peter Drucker is widely respected as one of the great thinkers on management. Throughout his career as teacher, writer, and philosopher he inspired students and business leaders alike with countless books and articles, lectures in the classroom, and informal conversations with friends and colleagues. Since his death in November 2005, several new books have been published, highlighting his wisdom, creativity and humor. In A Class with Drucker, William Cohen shares stories and insights into Peter Drucker’s teaching methods, his inspiring ideas and his life experiences. He also relates personal anecdotes about Drucker and his life. As a PhD student at Claremont University, Cohen studied under Drucker, who was a gifted and passionate teacher. Cohen maintained a lifelong friendship with his mentor and created a personal tribute to the man who changed his life. Ottinger, Randall J. Beyond Success: Building a personal, financial and philanthropic legacy. McGraw-Hill, 2008. When Tom Keller was Dean of the Fuqua School, he once noted that there were two phases of life: the acquisition phase and the divestiture phase. MBA students are focused on the first phase, acquisition. After graduation, these young men and women work long hours, take risks and make sacrifices for rewards that will come later. Inevitably as years pass, these young men and women will be successful at this phase and will achieve financial independence. And just as inevitably, they will someday be middle aged and find themselves in the second phase, divestiture, and may be surprised that this phase presents them with a different challenge — how to make a positive impact with their time and assets, building a personal and philanthropic legacy. For people starting to think about establishing their legacy, the book Beyond Success illustrates the issues involved in managing wealth, philanthropy and family. How much is enough? How should people structure their lives to do well and to benefit others? How should people structure their wealth to enable their children to fulfill their dreams without undermining their motivation? How do people manage to leave something of lasting value at the end of life? After providing a framework for creating a new vision and develop a road map for success, this book offers number of success stories. One is Mario Morino, who sold his company, Legent Corp to Computer Associates, and later formed Venture Philanthropy Partners, and who is now involved in Fuqua’s CASE (Center for the Advancement of Social Entrepreneurship) program. Also mentioned in this book is John C. Whitehead, formerly CEO of Goldman Sachs, who is also involved in CASE.